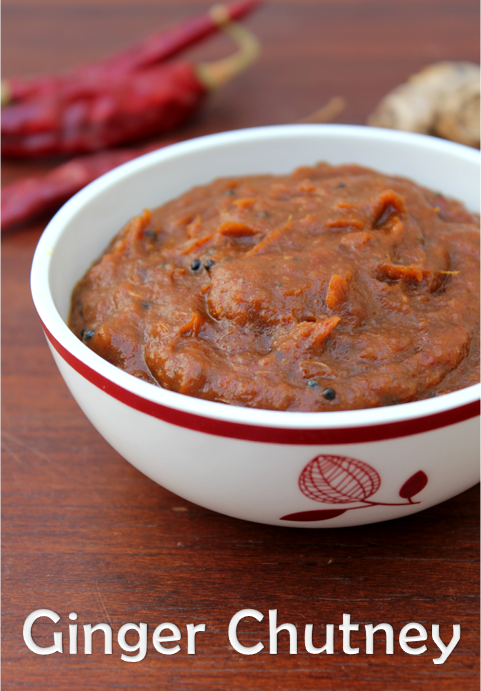 Ginger is one of my favourite spices.I love ginger in any form be it juice, pickle or in upmas and curries.I have been wanting to make this Andhra style pickle or chutney called Allam Pachidi. 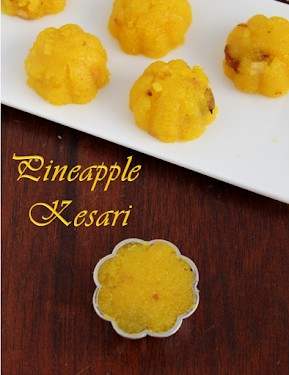 It is the best side dish or accompaniment for Andhra Pesarattu dosai. This pickle has all the tastes in it - it is spicy, sweet and tangy. It is a treat to all the people who love ginger in their food!!!! Hopefully I will make the pesarattu dosai sooooon!!!!!!!!! 1.Wash the ginger well, peel off the skin and chop them into pieces and keep aside. 3.Heat 2 tsp of oil, add fenugreek seeds and fry. Add urad dal and fry till the dal becomes golden brown. 4.Now add the broken red chillies and asafoetida. 5.Now add the curry leaves and give it a stir. Switch off the stove and allow it to cool. 6.Transfer these fried ingredients in to a mixer jar. Add ginger pieces, soaked tamarind, turmeric powder, jaggery and salt. 7.Heat rest of the oil crackle mustard seeds, add the ground paste and fry for two minutes and cool. It is best combined with Andhra Pesarattu Dosa, but you can have it with other dosas too!!!!!!!!! Adjust the number of chillies according to your spice level. It is an Andhra dish so it is spicy. Adding curry leaves is optional - it gives a dark colour to the chutney and is also good for health. Use Gingelly oil and rock salt for better taste and aroma. 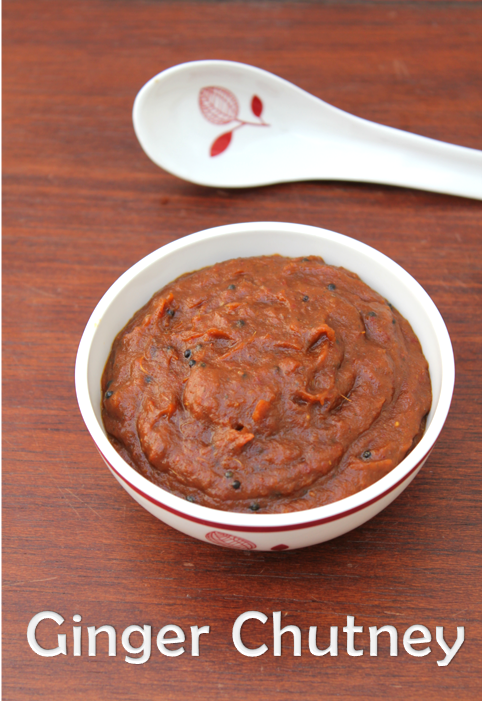 Allam Chutney is a typical side dish that has a blend of sweet, sour and hot tastes. 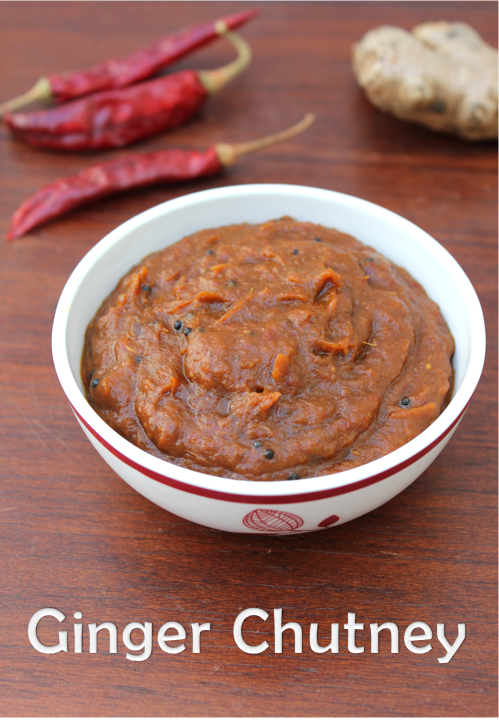 Your Ginger Chutney recipe is yummy.